The 'House of Pain' turned into the 'House of Joy' for the Wallabies with a 23-15 Tri-Nations victory against the All Blacks in Dunedin. It was the first time the Wallabies won a Test in 13 visits to Dunedin and they became the first country to defeat the All Blacks at Carisbrook, which was known as the 'House of Pain' for the misery inflicted on visiting teams. The victory, Australia's sixth in the past eight games against New Zealand, means the Wallabies retain the Bledisloe Cup and they have gone to the top of the Tri-Nations table. Both sides scored two tries in a game dominated by some thundering defence, but it was a penalty try awarded to the Wallabies in the 63rd minute that turned the game. English referee Steve Lander correctly penalised All Black No.8 Ron Cribb for tackling Joe Roff without the ball when the Wallaby winger had chipped ahead just eight metres from the line. The All Blacks will be desperately disappointed with a performance dominated by errors, a terrible lineout and sadly lacking direction in attack. Their handling was abysmal. "We couldn't get field position in the first half and when we did we turned it over," All Blacks captain Anton Oliver said. "They got really quick ball and we had a lot of slow ball." Eddie Jones will be celebrating his first victory as Wallaby coach and the fact that the side has finally shaken the Carisbrook monkey from its back, but he will know there is still some work to do. The Wallabies also struggled at times with their lineout, while the backs didn't click for a second successive game. A satisfying feature for Jones will be the performance of the Wallaby scrum, which according to many former All Blacks greats was supposed to crumble. Flanker George Smith was a giant at the breakdown, while five-eight Stephen Larkham showed no signs of the shoulder injury that had sidelined him, with a mountain of work in defence. "There had been some obituaries written but a team just doesn't suddenly become a poor team overnight," Jones said. "We scavenged for the ball pretty well and we always thought that was going to be an area that was important in this game." Unfortunately, the perceived divide between Northern Hemisphere and Southern Hemisphere referees over tackle and breakdown interpretations shows no signs of closing with Lander making some curious decisions. Memories of last year's Bledisloe Cup thriller at Stadium Australia came flooding back when Jonah Lomu, in his 50th Test, crossed in only the second minute of the game. But the All Blacks then proceeded to disintegrate blowing any attacking field positions with poor handling. The Wallabies didn't let the early setback affect them and they took the lead in the 16th minute when Matt Burke toed ahead from halfway after an initial break by Nathan Grey and beat Doug Howlett to the ball for the try in a superb individual effort. His conversion gave Australia a 7-5 lead and a penalty in the 21st minute extended that to 10-5, which the Wallabies took into half-time. Burke finished the game with 18 points with three penalty goals and two conversions, but will be disappointed with several misses. Tony Brown also had a wayward day for the All Blacks, missing several easy attempts in front of his home crowd. Brown and Burke swapped penalty goals to open the second-half before the Wallabies opened their match-winning lead with the penalty try following a smart grubber by Larkham. 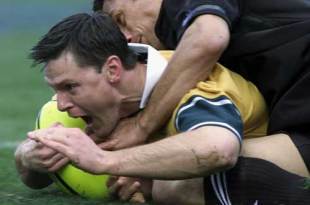 Burke added a further penalty with just over 10 minute remaining before Wilson scored the All Blacks' second try in the 77th minute after a bullocking run by Lomu. It was one of the few chances where Lomu was given room to move, but it was all too late. The All Blacks made an interesting decision with only seconds remaining that could come back to haunt them. They were awarded a penalty within easy kicking range for Andrew Mehrtens, who had replaced Brown, which would have taken them to within seven points of Australia and a bonus point. However, they chose to run it for no joy. NEW ZEALAND 15 Tries: J Lomu, J Wilson. Conversions: T Brown penalty goal, A Mehrtens goal. At Carisbrook, Dunedin. Referee: S Lander (Eng).